Caribou antler, Igloolik area, NWT, Dorset culture (courtesy NGC). Canada's Arctic has been inhabited by humans for at least 4,000 years. The first people currently known to have produced a significant amount of figurative art belonged to the Dorset culture (1600 years ago). The objects they carved from bone, ivory and wood included birds, bears and other land and sea animals, human figures, masks and maskettes, and face clusters. It is believed that these works had a definite magic or religious intent, and that they were worn as amulets or used in shamanic rituals. The people of the Thule culture (ancestors of today's Inuit) migrated from northern Alaska around 1,000 years ago and drove or wiped out the earlier Dorset inhabitants. Thule art was based on Alaskan prototypes; it included some human and animal figures, but consisted primarily of the graphic embellishment of utilitarian objects such as combs, needle cases, harpoon toggles and gaming pieces. The decorative or figurative incised markings on these objects do not seem to have had any religious significance. At first glance, Inuit sculpture may seem to be a relatively homogeneous art form but, in fact, its subject matter and styles are richly varied. The Inuit population (about 56,000 in 2002) is widely distributed across Canada's north, so that each of the 30 or so art-producing communities has developed its regional styles with their favourite subjects and distinctive sculptural styles. The themes of Arctic wildlife, and traditional Inuit hunting and family scenes are still popular but spirit figures, and mythological and shamanic images also abound. Styles range from naturalism or decorative stylization to minimal abstraction, and from brutal expressionism to whimsical surrealism. The personal styles of individual artists are readily identifiable by avid collectors and patrons of Inuit art. With the exception of Baker Lake, the major Inuit sculpture producing settlements, mostly ranging in population from a few hundred to 1,000 people, dot the Canadian Arctic coastline. While each community has its own style, certain regional characteristics are apparent. The sculpture of Arctic Quebec (Nouveau Quebec / Nunavik) tends to be naturalistic, and is often narrative in nature. Animals and realistic hunting scenes, as well as legends and stories, are favoured subjects. The predominantly grey stones are generally blackened and polished, then incised. Artists from southern Baffin Island work in a variety of stone types. These sculptors seem to view the stone as a challenge, working against it and fashioning intricate, delicate and dramatic pieces with flair. Elegant or humorous animals are popular subjects. The sculpture of the Central Arctic varies from a kind of expressive realism to surrealism, with a focus on spiritual or shamanic themes. Facial features are often exaggerated with intricate inlaid details. Stone and whalebone are popular mediums for Central Arctic carvers. The Keewatin stones are grey to black in colour and hard. 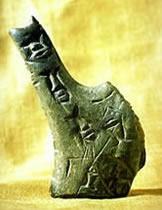 Artists use this stone as an expressive element in their work. Details are few, and many works are not highly polished. Human subjects, especially family scenes, predominate. Naturalistic animal and hunting themes typify the art from the northern Baffin Island, the Western Arctic and the Labrador regions. A colder climate disrupted the Thule culture in the 16th century, about the same time as contact with the European peoples began. Inuit began to barter with whalers, missionaries and other foreigners. Carvings of animals, as well as replicas of tools and western-style objects, most often fashioned from ivory, became common trade goods. The first few centuries of European contact are usually referred to as the Historic Period. The contemporary period of Inuit art began in the late 1940s. 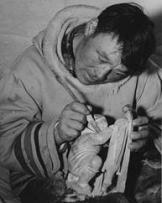 When the federal government recognized the potential economic benefit to the Inuit, it actively encouraged the development and promotion of Inuit sculpture. Early development of Inuit art was greatly assisted by the Hudson's Bay Company and the Canadian Handicrafts Guild. Inuit-owned cooperatives were established in the 1950s and 60s in most Arctic communities, as well as art marketing agencies in southern Canada. As well as providing much needed income in isolated Arctic villages, Inuit sculpture has achieved an international reputation as a major contemporary art form. 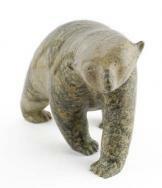 Stone has replaced ivory as the most popular carving material in contemporary Inuit art. This has led not only to a greater variety of colours and forms, but also to the larger size of many modern Inuit sculptures. Ancient weathered whalebone is another popular carving material, but international restrictions on its use and that of ivory have resulted in a decline in their use. Caribou antler and musk-ox horn are also carved when available. Many works combine two or more of these materials; for example, antler or ivory is often used as inlay in stone sculptures. Although the generic term "soapstone" is commonly used, this is a bit misleading. Soapstone, a soft talc steatite, is not used nearly as much as the harder serpentine, serpentinite, siltstone, argillite, dolomite, quartz and other types. Stone is the most versatile carving material because it can be worked to almost any size and shape. Its colours range from rather dull grey to luscious, almost semi-precious greens, whites, blue-greens, and blacks. Ivory, whalebone, antler and horn are more restrictive, but Inuit sculptors have nevertheless managed to take advantage of their naturally occurring shapes to produce a seemingly endless variety of forms and subjects. Materials are often in short supply, and artists must travel great distances overland or by boat to quarry quantities of good quality stone. Once the materials are obtained, carving proceeds in a fairly straightforward manner. The necessary skills, perfected in the fashioning of traditional implements, have been passed down through generations of Inuit. Most sculptures are still produced with hand tools, although a growing number of artists use small power tools as well. Saws, axes and adzes, hammers and chisels are used for the initial roughing out stages of a carving. Files, rasps and, finally, steel wool and sandpaper are utilized for fine work and finishing. Penknives or nails may be used for detailed incising. Reproduced by permission of The Department of Indian and Northern Affairs Canada.